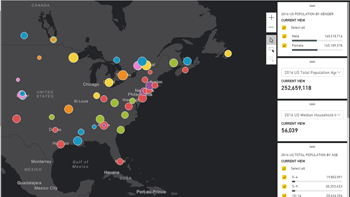 ArcGIS Maps for Power BI takes your map visualizations to the next level with the world’s leading spatial analytics. 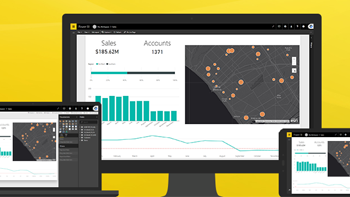 This built-in Power BI feature provides enhanced mapping capabilities, demographic data, and compelling maps. A monthly Plus subscription to ArcGIS Maps for Power BI gives you access to global demographics, hundreds of geographic layers from the Living Atlas of the World, more basemaps, and the ability to view more locations on your maps. Or sign in with your ArcGIS Online account to receive all Plus capabilities and access content from your organization. 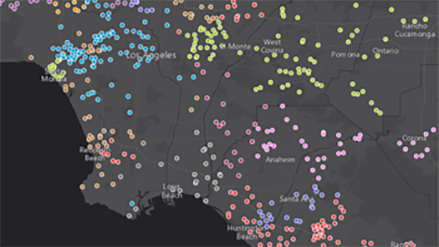 ArcGIS Maps for Power BI includes a set of map tools that let you customize the contents of your map and how they're displayed, providing deeper insight into your data. When you add a large number of features to a map, it's often difficult to visually extract meaningful information if hundreds of points overlap. Clustering groups of features within a certain distance of one another makes it easier to quickly analyze your data. Add infographics cards to quickly view contextual information about the areas surrounding the data features on your map, including population, age distribution, or income levels, among others. In addition to location fields, you can add other data fields to a map to better tell your story.